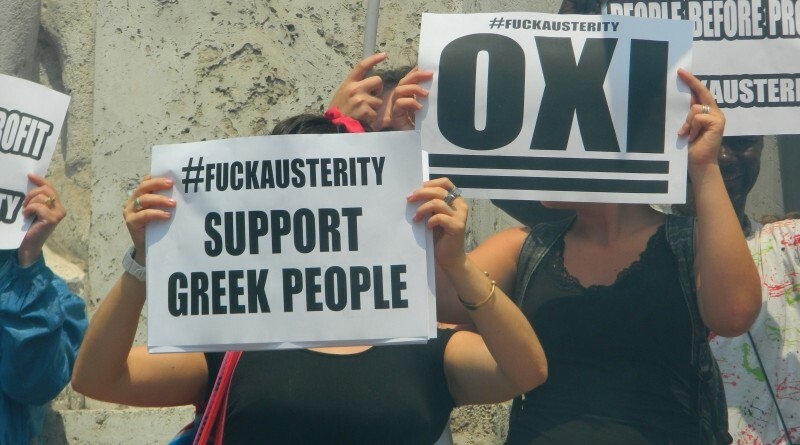 After a heated debate leading up to the shocking referendum in Greece today, the vote clearly came to the side of the ‘Oxi’ (No) voters this evening. With a full 61% of the voters voting against the bailout terms, Greece is now on the brink of leaving the 19-member EU. Whether forced out by debt they can not possibly pay, with an inevitable default, or forced out by their own will against attempts to keep them in the Eurozone by the Trioka, Greece is now playing with fire and setting the stage for something few thought was possible only a few short weeks ago. ‘Europe is dying from the inside’ was heard from opposition on the far left and right across all of Europe today, as anti-EU leaders such as Nigel Farage and Geert Wilders took to social media and interviews describing the future Europe. These parties, such as the UK independent party, have been massively on the rise in recent years across all of Europe as countries battle with unsustainable immigration, poor economic growth, strained social programs and several crises. Anti-EU parties around Europe celebrated the announcement of the Greek referendum results, hoping it will hasten in similar votes in other countries. Prime Minister David Cameron has promised to hold a similar referendum in the UK before the start of 2017. Opposition leaders such as Nigel Farage of the UK Independent party see this has the perfect opportunity for the UK to follow suit, allowing them to finally control their own immigration and monetary policies. Opposition parties around Europe lauded the decision of the Greeks to control their own destiny, hoping that countries with their own strong economies, like the UK, Netherlands and Finland will soon follow suit. These plans will take time, they say, but should be easier for the countries not presently using the Euro like the UK. While the headlines tomorrow will focus namely on the Greek default, opposition parties are calling today the first day in the end of the Euro as a unified currency across the continent. These parties have gained significant support in recent elections all across Europe, garnering 25% of the European Parliament seats in the latest elections. The far right leader in France, Marie Le Pen, called this a victory over the EU oligarchs, which have been blamed for years for their pillaging of 500 million citizens across Europe. They blame them for allowing immigration to tear at the foundations of Europe, undermining their culture and destroying the benefits of taxpayers. Ultimately, if Greece does drop out of the $11 trillion + annual Eurozone, as many British banks now bet will occur, this will be the perfect setting for the UK’s referendum next year in which voters will be put to the same question of EU membership. Although polls today still show a small majority in support of continued membership, years of erosion of social programs and the tax base in the UK via immigration is creating increased incentives to defect. If Greece does leave, this will set a legal precedent for the action that did not exist before. One thing that’s for sure, if Greece leaves, this will not be the end of the conflict. Unless the EU pushes to control and curb or even stop immigration, a source of great strife between the healthier and weaker economies, Greece likely will not be the last.